The TIRION TriRetrograde Seconds Skeleton line reveals the creative expertise and craftsmanship of the designers and master watchmakers of the tradition-rich Swiss watch brand. This quality timepiece shows its strengths in both design and technology with the sophisticated and fascinating retrograde seconds display function. The name of the TIRION is derived from the constellation of Orion, one of the most easily recognizable and brightest in the heavens, located in the equatorial region of the sky. The exact rhythm of the retrograde seconds function in three sectors of 20 seconds each is given by a Swiss quality mechanical movement in an exclusive special version with automatic winding. The imaginative concept of changeability has already been embodied in the successful HERIOS and MEREA TriRetrograde Seconds Skeleton lines. 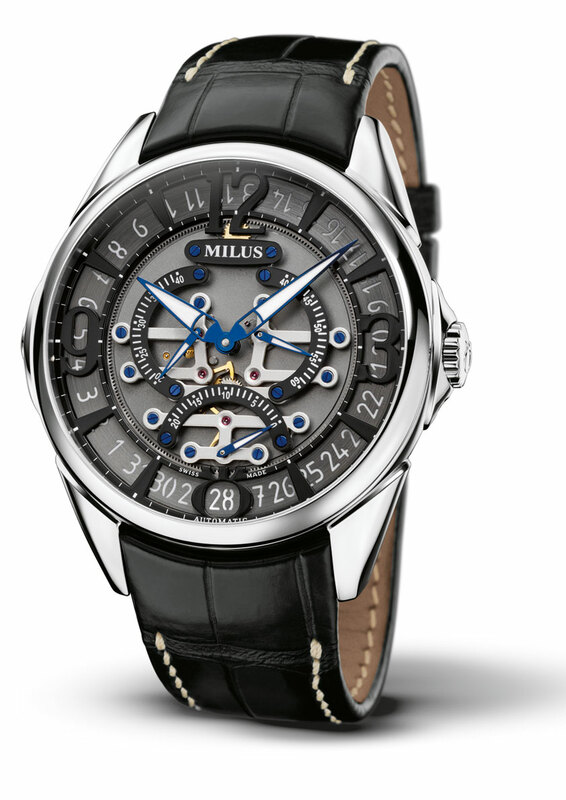 Just as unusual and rare as the TriRetrograde function is the unique dial, which is placed in the round, nine-part case. 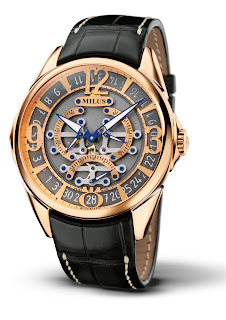 It is built up of two layers: the movement base is micro-blasted, the second level is decorated with the faceted latticework formed by the Arabic numerals 3, 9 and 12 and the skeleton Milus symbol at 6 o'clock that allows a clear view of the date display. The composition of the three seconds display sectors is of eye-catching design: skeleton hours and minute hands constantly allow a view of the three blued seconds hands that jump back in 20-second rhythm. Starting at 6 o’clock, the first hand jumps instantly back to the right to its starting position after 20 seconds. Going clockwise, the next seconds hand at 10 o’clock followed by the third at 2 o’clock take over the same task. This alternation tirelessly repeats itself, giving the overall impression of a magic dance performed by the seconds hands. Mechanical perfection reveals its secrets: the dial of the TIRION TriRetrograde Seconds Skeleton is a picture of unique precision and allows an exclusive view of the inner life of the automatic movement via the opening at its centre. Connoisseurs of consummate craftsmanship will be fascinated. 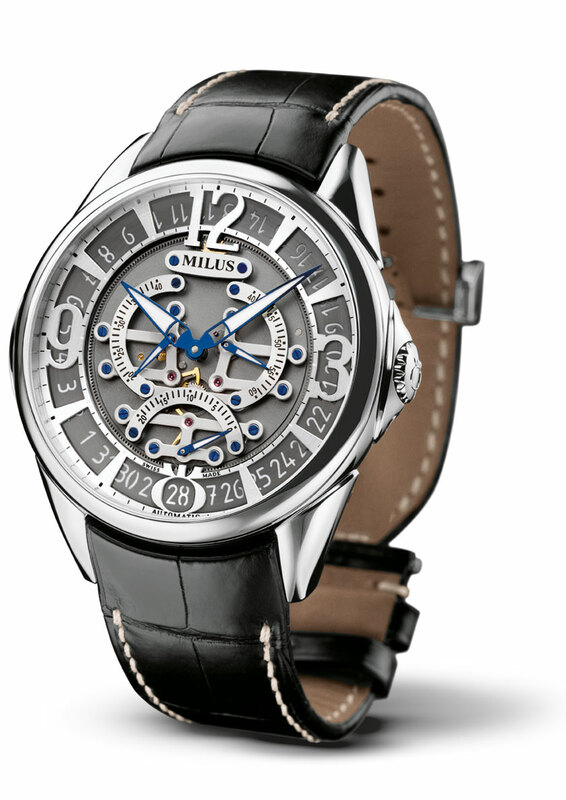 This timepiece shows off its talents at the back of the case also. The round convex sapphire crystal window in the screwed-down case back gives a view of the movement and the skeleton oscillating rotor in the form of the Milus logo with the brand symbol at its centre. A comfortable integrated alligator leather strap rounds off the elegant appearance of the watch. An exceptional function combined with extravagant design and superlative Swiss watchmaking art: with the TIRION TriRetrograde Seconds Skeleton, Milus sets a further milestone in its imaginative conceptualisation of this exceptional mechanical complication, combined with superb craftsmanship.